God’s green light: What are you waiting for? Have you ever been sitting at the traffic lights behind another car? In the book of Acts, Paul, Christ’s ambassador, ends up in Athens. He sees idols, idols, everywhere, but not a God who lives! They even have an altar to an ‘Unknown God’. So because Paul knows the Unknown God, through the risen Jesus, he can’t help speaking out. He encourages them that they can know the one true God (not lots of false ones), a living God who made the world (not dead idols who had to be made by human hands). Although God doesn’t need us (our temples, our prayers, our statues), he does want us. He’s not far from any one of us. But our idolatry and sin get in the way. Dear reader, will you be ready on that day? Will you come to Jesus now as your loving Saviour so you won’t have to face him then as your angry Judge? Have you repented and turned to God? Have you given God the green light? If not, what are you waiting for? 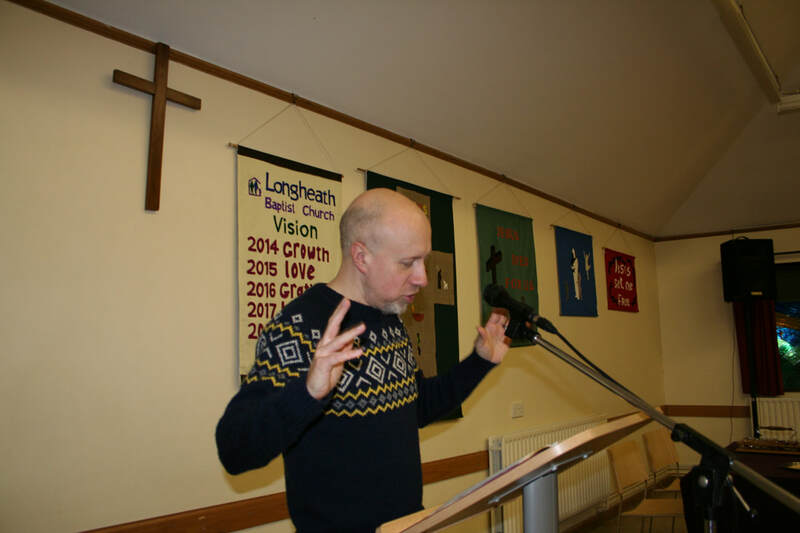 At Longheath Baptist Church we have a ‘Word of God’ problem. Our ‘pew’ bibles have been passed around, piled up, accidentally dropped by the children who help pack them away after the service and thankfully opened and read so often since I ordered 40 shiny new NLT Giant print bibles that the spines are now clinging on for dear life. It’s a problem. But, by God’s grace, a good one to have. Keep it simple. We chose the most accessible Bibles we could find for our services. So we changed from NIV to NLT and went for giant print because you’d be amazed how many people come to church without their glasses. Video clips. One of our most successful ways of getting the gospel to the unreached is our Sunday evening ‘Food 4 Thought’. Sitting around tables. Snacks followed by a fun discussion question then a gospel-related short video followed by a thought-provoking gospel question. The most ‘street friendly’ are Christianity Explored’s ‘Soul’ and our own Pete Woodcock’s Parables series. But with a little creative thinking a lot can be done with YouTube clips. Open the Bible where people are already comfortable. We tried to get teens to join us in our church hall to play ‘fun’ games with no success. Then one of the mums told us that a large bunch of teens often hang out in her front room so we turned up once a week and gave them a bible study. Word of mouth filled the room with teens eager to laugh about their school day and study how the bible had something life-changing to say to them. Mums the word. As in — we aim to leverage the contacts of our most successful networkers. Mums. Estates are matriarchal societies and you only have to go to the school gates to see masterful networkers in action. These guys can distribute a Spiderman lunchbox, dropped coat, a dummy and our event fliers. Power mums. Find out who yours are and use them. One to ones work wonders. We call them Mentors and study Mark because it is the shortest, has a clear structure, is full of action and surprises and has our Saviour’s glorious call to self-denying discipleship in chapter 8. Below Neil explains a little about how God has blessed our Mentor Bible studies. 1-1 Bible studies, in my view, have been the single most fruitful endeavour in my Christian walk. Other than those invaluable bedtime quiet times with my parents growing up, I was first approached at 22 to study God’s Word with another guy. I wish it had been a decade earlier. Since then, the Lord has given me the privilege of reading the Bible in a sustained fashion with around 40 men, and I’ve been incredibly struck with just how much impact it has had on both their lives and mine. At Longheath, we created a Mentors programme to help 5 men and 5 women study the Bible 1-1, and this is bearing fruit. D, a man who had sustained a serious head injury, has now completed Mark’s gospel, Just for Starters, Man of God and we are surging through Luke. I thank God for him. The changes in his attitude and life have been remarkable – he is one of the first to arrive at church, and goes out of his way to help those more vulnerable than himself. Believe me, God’s Word is like positive radiation. Prolonged exposure leads to significant spiritual health benefits, and even to new life. So, why not chat with your leaders, and give 1-1 Bible study a go with whomever God lays on your heart? "But with God everything is possible..."
​"But with God everything is possible..."
​With these words Jesus explains how an impossible rescue happens all over the world every day to people like you and me. What is impossible for us is one of God's specialties. And this is not just true when it comes to entering the Kingdom of God. I am reminded again and again that when facing seemingly hopeless situations and blocked paths, God hears our prayers and the faith that doesn't give up and bulldoses through the barriers to clear our way ahead.